Coups d’etat have become a notably less common method of regime change since the end of the Cold War. According to the Center for Systemic Peace, which maintains extensive databases on various forms of armed conflict and political violence, there were just 13 coups worldwide between 2000 and 2012 (plus last year’s coup in Egypt), versus 21 since the 1990s. While most people would judge that an improvement, Vanderbilt University’s Latin American Public Opinion Project has found that, under the right circumstances, sizable shares of the population in several nations would countenance military takeovers of their countries. It may not be surprising that significant numbers of people in countries with histories of military intervention might see coups as a justifiable reaction to perceived failures in governance. Paraguay, Peru, Guatemala and El Salvador, for instance, each have experienced five successful coups since the end of World War II. But other results are harder to explain: Guyana has never experienced a coup or attempted a coup since independence in 1966, while Argentina has had seven (plus eight unsuccessful attempts) just since 1946. 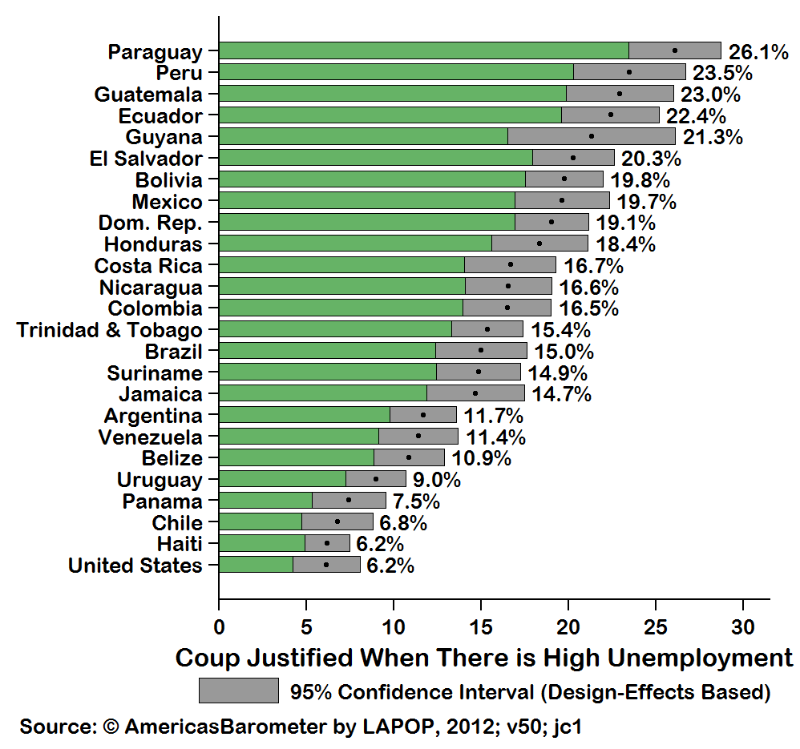 Perhaps the most interesting finding: 6.2% of people in the U.S. (no coups or attempted coups in its 200+ year history) said high unemployment would justify one — the same percentage as in Haiti (six successful coups and seven unsuccessful attempts since 1946).